A lot of people wonder what anthropologists do. Here is a short video we put together, asking some of our faculty what their research interests are. Check it out! 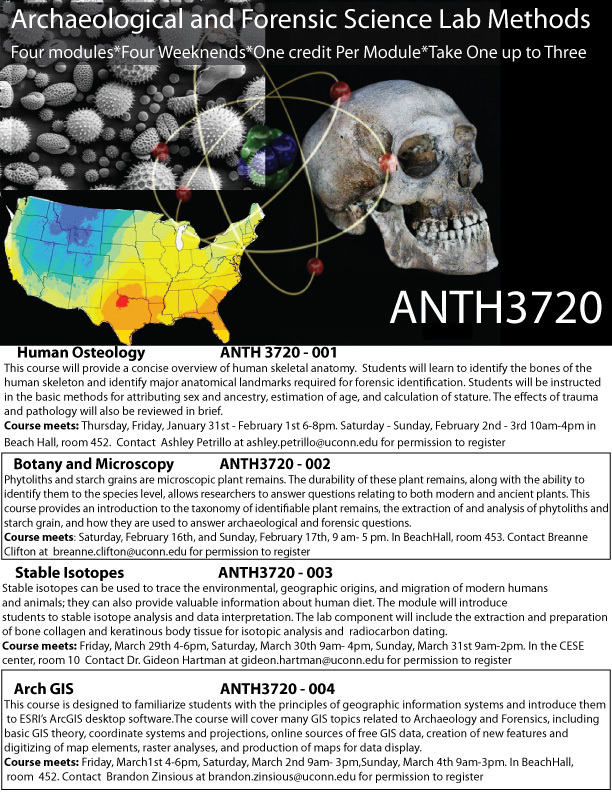 Registration for up to three out of four one credit weekend modules in Archaeological and Forensic Science lab methods will be opening up shortly. Please see this flier for more information, or contact gideon.hartman@uconn.edu. 2012 UConn Anthropology alumnus, Dr. Nathan Wales, was recently announced as a new lecturer at the University of York Archeology Department. Nathan, who works with ancient DNA material, will be leading the ancient genetics group at BioArCH. Read more about Nathan here. Nicholas J. Conard is a professor of Anthropology, currently the director of the Department of Early Prehistory and Quaternary Ecology, at the University of Tübingen, Germany. This lecture will detail recent archaeological finding on the evolution of art and music. The location is the Thomas J. Dodd Research Center, Konover Auditorium (UConn, Storrs). The time is 4 pm on Thursday October the 11th, 2018. More details in the flier here. New UConn Anthropology professor Deborah Bolnick was recently interviewed for Science Magazine. Focus was on the Summer Internship for Indigenous Peoples in Genomics project (SING). SING works to connect anthropologists with indigenous people, to help with co-operation and understanding. Read the article here or here.